These typ es of poultry can be started much as we outline for baby chicks. Each of these birds should be started on a 28-30% Turkey Starter or Game bird feed. If neither of these feeds can be found, they can be started on 20-22% Chick Starter. At 8 weeks of age, switch them from Game bird/Turkey Starter to an 18-20% Grower. As you might expect, going with the higher protein feeds will speed the growth of these types of fowl. However, if they are not available, the Chick Starter and Grower feeds will do the job for you. 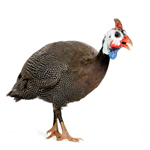 With all types of poultry, it is important that Guineas be kept out of the waterers. If you experience the birds getting into the waterers and getting soaked, place some small rocks or marbles in the drinking trough. This will normally solve the problem.